Not to be confused with Office of Counsel to the President. President's Counsel (postnominal PC) is an eminent lawyer who is appointed by the President of Sri Lanka to be one of the "President's Counsel learned in the law". The term is also recognized as an honorific which replaced the practice of appointment of Queen's Counsel (QC) which ceased when Sri Lanka became a republic in 1972. It is equivalent to the appointment of Queen's Counsel in the United Kingdom and other Commonwealth jurisdictions and derives the same privileges such as the privilege of sitting within the Bar of court. President's Counsel is a professional rank and status, conferred by the President under the Article 33 of the Constitution of Sri Lanka which is recognised by courts. It does not entail the title holder to be a state prosecutor or employed by the state or part of the office of the President. Appointments are made from Attorneys-at-Law who have practiced as counsel in original and appellate courts for many years either in the official or unofficial bar. When a holder of the title of President's Counsel is appointed to the judiciary he does not lose the title. The appointment is made by the President by letters patent, thereafter the appointed President's Counsel takes the oath of office at a ceremonial sittings of the Supreme Court at which point the appointee is considered a President's Counsel and are called to the Inner Bar. Law officers who are public prosecutors of the Attorney General's Department are customarily appointed as President's Counsel after they are promoted to the grade of Additional Solicitor General. These may be singular appointments made several times a year after their promotion. Once in several years, several attorneys from the unofficial bar will be appointed based on recommendations forwarded by the Chief Justice, Attorney General and the President of the Bar Association of Sri Lanka to the President. In 1903, Frederick Dornhorst, Ponnambalam Ramanathan and Thomas De Sampayo were sworn in as the first King's Counsels in the island of Ceylon, which was a British colony at the time. Since then eminent lawyers who were advocates were appointed as King's Counsel until the title changed to Queen's Counsel with the change of monarch. When Ceylon became a republic in 1972, appointments of QCs was not possible and equivalent of "Senior Attorney-at-Law" used. In 1984 the 8th amendment to the constitution of 1978 granted the president powers to appoint "as President's Counsel, attorneys-at-law who have reached eminence in the profession and have maintained high standards of conduct and professional rectitude." It also grants President's Counsel "all such privileges as were hitherto enjoyed by Queen's Counsel". The holder can use the post-nominal letters PC after his or her name. In 1984 Senior Attorneys-at-Law were reappointed as PCs. ^ "Appointment of President's Counsel". ^ "25 senior lawyers appointed as President's Counsel". www.adaderana.lk. ^ "Sri Lanka News - Online edition of Daily News - Lakehouse Newspapers". archives.dailynews.lk. ^ Jeyaraj, D. B. S. (30 September 2000). "Obituary: A pioneering leader - M.H.M. Ashraff, 1948-2000". Frontline. 17 (20). ^ Samad, Ashraff A. (16 September 2012). "Remembering a Minister, poet and inspiring Muslim leader". The Sunday Times (Sri Lanka). ^ "SLMC, NUA remember late leader Ashraff". TamilNet. 16 September 2003. ^ a b c d e "History of the Office of Attorney General in Sri Lanka". Attorney General's Department - Sri Lanka. Retrieved 16 July 2018. ^ "Court has jurisdiction: President's Counsel". ^ "Features - Online edition of Daily News - Lakehouse Newspapers". archives.dailynews.lk. ^ AG. "Attorney General Palitha Fernando PC retires". www.attorneygeneral.gov.lk. ^ Maniccavasgar, Chelvatamby (8 March 2009). "Add. Solicitor General to take silk as PC". 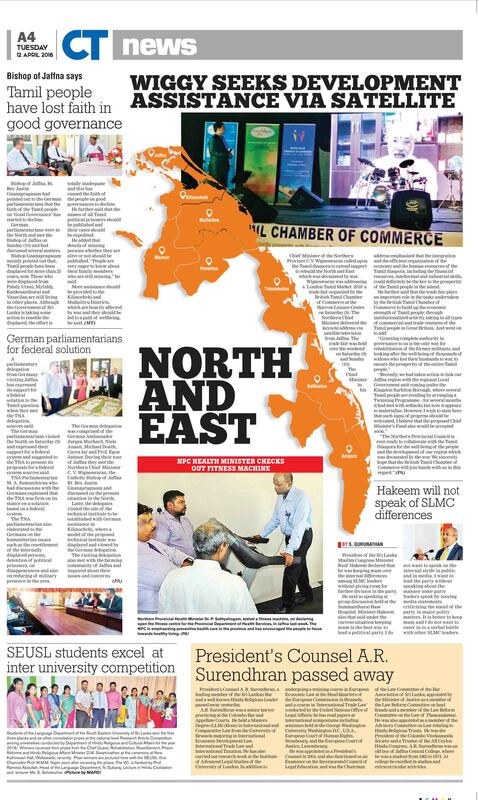 The Sunday Times (Sri Lanka). ^ Maniccavasgar, Chelvatamby (5 March 2009). "A. Gnanathasan takes Silk as President's Counsel". Daily News (Sri Lanka). Archived from the original on 10 March 2009. ^ "Additional Solicitor General Sarath Jayamanne appointed President's Counsel - Sri Lanka Latest News". 18 February 2015. ^ User, Super. "The Law Officers". www.attorneygeneral.gov.lk. ^ a b "President appoints 21 President's Counsel members". www.adaderana.lk. ^ "Priyantha appointed Judge of Supreme Court - FT Online". www.ft.lk. ^ "Funeral of former AG to be held at Borella cemetery today". The Island (Sri Lanka). 15 August 2007. ^ Neelakandan, Kandiah (17 August 2007). "Appreciation: Late Mr. K.C. Kamalasabayson, P.C., Former Attorney-General". The Island (Sri Lanka). ^ "2012 - Award winners". Ceylon Today. 4 January 2013. ^ Ramanayake, Wasantha (5 May 2005). "Interim Committee SLC directed to maintain status quo". Daily News (Sri Lanka). ^ "The role of the judiciary in upholding democracy: Lessons from Sri Lanka". The Sunday Times (Sri Lanka). 1 February 2015. ^ a b "ePaper | Online edition of Daily News - Sri Lanka". epaper.dailynews.lk. Retrieved 2017-05-20. ^ "Sri Lanka's Legal Fraternity In Jeopardy – Tilak Marapana Reveals". ^ Selvanayagam, S. S. (19 December 2011). "Forth generation of Musthaphas forays into legal domain". Daily FT.
^ "Father and son both President's counsel". The Island (Sri Lanka). 16 November 2012. ^ Arumugam, S. (1997). Dictionary of Biography of the Tamils of Ceylon. p. 131. ^ a b LTD, Lankacom PVT. "The Island". www.island.lk. ^ a b "25 senior lawyers made President's Counse". The Daily Mirror. Colombo, Sri Lanka. 27 April 2017. Retrieved 7 May 2017. ^ "Twenty-five senior lawyers appointed President's Counsels". Daily News. Colombo, Sri Lanka. 27 April 2017. Retrieved 7 May 2017. ^ "President's Counsel A.R.Surendran no more". Tamil Diplomat. 12 April 2016. ^ "President's Counsel A. R. Surendhran passed away". Ceylon Today. 12 April 2016. p. A4. Archived from the original on 28 April 2016. ^ Altaf, Saleem (6 August 2006). "Neelan Tiruchelvam: Distinguished son of esteemed father". The Island (Sri Lanka).